Louis Tomlinson and Zayn Malik are heard joking about "illegal substances" as they smoke a rolled-up cigarette in the back of a car. Tomlinson, who is believed to be filming the video, is heard saying "So here we are, leaving Peru. Joint lit. Happy days!" as smoke fills the camera shot. Malik, who is filmed throughout the five minute video, is then passed the "joint" and begins smoking. The video has been published by the MailOnline which says it was filmed on April 27 while the singers were being driven through Peru on their way to a concert at the Estadio Nacional in Lima. Tomlinson, who narrates the video, later pans to a police motorcyclist driving past them and laughs, saying: He's having a look. He's thinking, 'I'm sure I can smell an illegal substance in there'. And he's hit the nail on the head." At one point Tomlinson asks his fellow band member "What do you think about that kind of content?" and Malik responds "Very controversial". 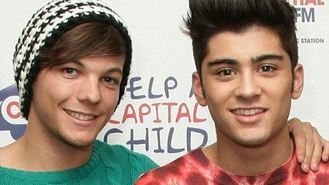 The pair also discuss One Direction's last book, with Malik describing it as "so girly and not cool". Other band members Harry Styles, Liam Payne, and Niall Horan were believed to be travelling in different cars and were not seen in the video. One Direction rose to fame as teenagers on ITV's X Factor talent show and have become one of Britain's biggest bands with a huge and loyal following of young girls across the world. Their latest tour Where We Are began last month in Bogota, Columbia but tonight the band will perform their first date in England, playing at the Stadium of Light in Sunderland. Following the end of the South American concerts, Malik tweeted: "Touring South America was incredible !! Thankyou! to all of amazing! supportive! Wonderful! Fans!! big love gonna get some rest now :) x"
While Louis added: "South America was amazing !! Sooooo good ! Thank you to everyone !!" The five members of One Direction were earlier this month named fourth in the Sunday Times Rich List with an estimated fortune of £14 million each and a combined wealth of £70 million. A spokesman for One Direction told MailOnline: "The matter is now in the hands of our lawyers."